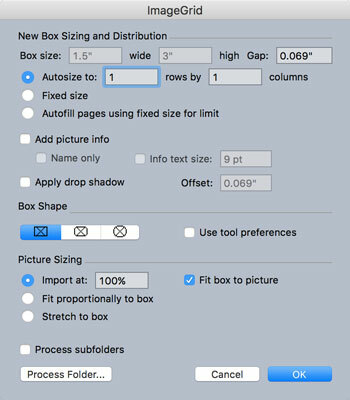 If the PDF, EPS, or AI file is already in a picture box on your QuarkXPress page, select it; if not, choose File→Import. Navigate to the file you want to import and click Open; and if the file is a multipage PDF, choose the page you want to import. QuarkXPress creates a new picture box containing the file. With the new picture box selected, choose Style→Convert to Native Objects (or right-click and choose Convert to Native Objects). In the Convert to Native Objects dialog box, select the Retain Source Picture Box check box if you want to keep the original picture box as well as make a converted copy. QuarkXPress converts the pictures, text, shapes, and lines in that file to native QuarkXPress items. If some of the items overlap in unexpected ways, try deselecting the other two options in that dialog box (Ignore Soft Masks and Ignore Transparent Blend Modes) and then convert again. To edit individual items, choose Item →Ungroup. If you have many items, you may need to repeat the Item → Ungroup command, or choose Item → Ungroup All to ungroup all groups within groups. You don’t have to convert an entire document. If you import the file into a QuarkXPress picture box and crop it, only the area showing in the box is converted. Designers often work with charts, graphs, and PowerPoint slides that almost never use the correct colors or fonts for a company’s brand. Conveniently, when you convert these items to native items in QuarkXPress 2016, their colors are added to the Colors palette, where you can replace them all at one time with your brand-approved colors. The text in these graphics is also converted to native QuarkXPress text, so you can easily format it to match the brand by using style sheets. After they’ve been converted, vector graphics become native QuarkXPress items and Adobe Illustrator paths become QuarkXPress paths with the exact same Bézier anchor points as in Illustrator. You can then use the Bézier (pen) tools in QuarkXPress to adjust them. Here’s a time-saving use for these conversions: Publications almost always receive advertisements in PDF format, and after they’re converted to native QuarkXPress items, the publication can update prices, dates, and colors inside the ad. That capability has never existed in a page layout program before. Also, publishers who import charts or maps now have a unique trick available to use. After converting to native QuarkXPress items, you can resize the chart or map without changing the size of the text within it. The Scale feature (choose Item →Scale to use it) in QuarkXPress lets you choose which attributes to scale. To convert your QuarkXPress layout back to Adobe Illustrator, export it in PDF format (File→ Export→Layout as PDF) and then open the PDF in Illustrator. However, do this only if absolutely necessary, because Illustrator won’t recognize your QuarkXPress layers, and many items will break into smaller parts, making editing very difficult. QuarkXPress currently imports only one page at a time from a PDF file. If you want to import multiple pages simultaneously, try PDF Importer XT from Creationauts. This $20 XTension lets you choose which pages to import from a PDF: selected pages, or only the even or odd pages. When importing the PDF, the XTension creates a new QuarkXPress page for each page in the PDF and optionally converts its objects to native QuarkXPress items. Open the PDF in Acrobat and find where Acrobat lets you extract multiple pages as separate PDF files. The location is different in each version of Acrobat, so look for the area containing the Pages tools and then look for Extract. After extracting all the pages as separate PDFs, rename the first nine so that the number in their filename has a 0 before it (for example, change 1 to 01, 2 to 02, and so on). That way the pages are imported in the correct order. In QuarkXPress choose Utilities→ImageGrid to open the ImageGrid dialog box. In the ImageGrid dialog box, select the Autosize To radio button and enter 1 into both the rows and columns fields, as shown. Click the Process Folder button in the ImageGrid dialog box and choose the folder that contains your separate PDF page files. Watch while QuarkXPress builds a new page for each PDF file and imports the PDF into a picture box on it. (Optional) Select the picture box on each page and choose Style→ Convert to Native Objects to convert the PDF to native QuarkXPress items.